At an event in Shanghai today, Xiaomi announced its much-awaited Mi Mix 2S smartphone, along with a couple of other devices. The company had already revealed a lot of details of the phone before the launch, including the design and the cameras. The design remains the same from the front, but it is much different from the rear as compared to its predecessor, the Mi Mix 2. 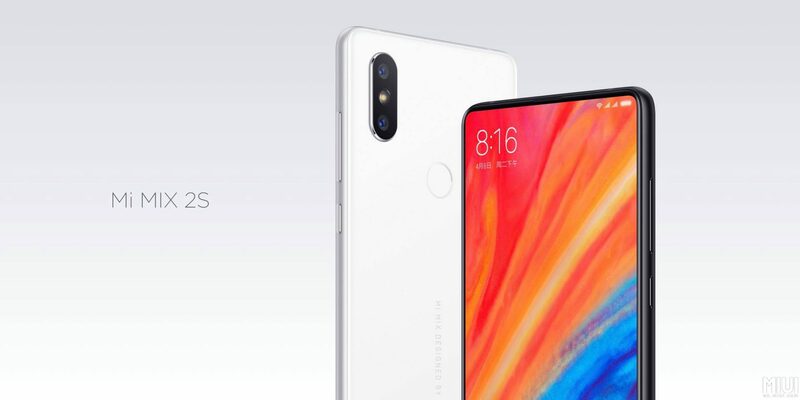 As for the specifications, the Xiaomi Mi Mix 2S has a more powerful chipset, better camera hardware, better software, wireless charging and more. The Mi MIX series has constantly pushed boundaries, defying everyone’s expectations about smartphone design and performance, and showcasing how Xiaomi is committed to being at the forefront of innovation. Mi MIX 2S now comes with a powerful dual camera and integrated AI features for an experience on the move like no other. Let’s talk about the design and the specifications of the phone in this particular article. Talking about the design first, you won’t notice any difference at all if you compare the Mix 2 and Mix 2S side-by-side from the front. The design from the front remains the same. But, things change at the rear as the Xiaomi Mix 2S has a vertical dual camera setup, just like the one on Redmi Note 5 Pro. The fingerprint scanner retains its position on the rear. According to Xiaomi, the Mi Mix 2S has a slightly more screen-to-body ratio than the Mix 2, as the bezels are reduced a bit (You will hardly notice that!). The build materials remain the same, i.e., metal and ceramic. Just like the Mi Mix 2, the Xiaomi Mi Mix 2S doesn’t feature a 3.5mm headphone jack as for some reasons, Xiaomi has ditched it. The USB Type-C port is present on the bottom, along with the speaker grill and primary microphone. The volume rockers are on the right side and below them is the power button. Coming to the specifications now, the Mi Mix 2S comes with a 5.99-inch Full-HD+ IPS Display with 2.5D curved glass on top. A Snapdragon 845 processor powers the phone, which is paired with the Adreno 630 GPU. There are two RAM variants – 6GB and 8GB. As for the ROM options, there are three variants – 64GB, 128GB, and 256GB ROM. 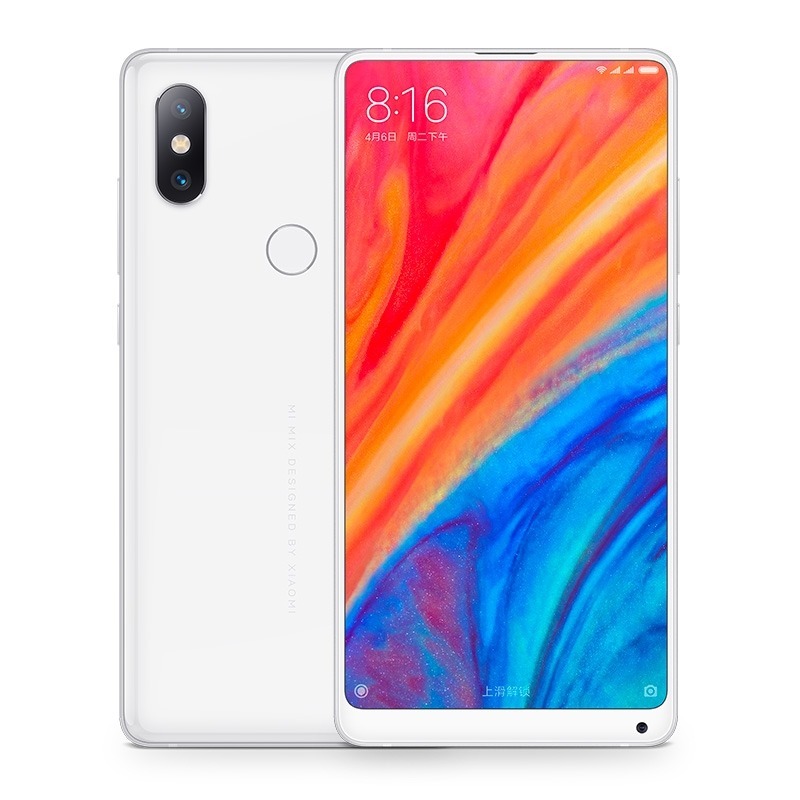 So, the Xiaomi Mi Mix 2S comes in three variants in total – 6GB RAM + 64GB ROM, 6GB RAM + 128GB ROM and 8GB RAM + 256GB ROM. There is no SD card slot, but we don’t think you will need it if you go for 128 or 256GB ROM variants. Now coming to one of the most important updates in the Xiaomi Mi Mix 2S, the cameras. There is a dual rear camera setup that is placed vertically. It includes dual 12MP sensors with the primary 12MP camera (IMX363) having 1.4ɥm pixel size and f.1.8 aperture while the secondary 12MP sensor having 1ɥm pixel size and f/2.4 aperture. 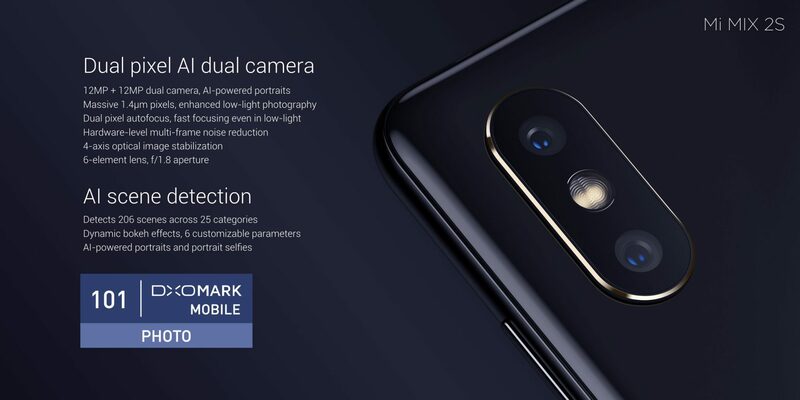 Some camera features include Dual Pixel Technology, AI Portrait Mode, AI Scene Detection, Dynamic Bokeh effects, 4-axis OIS, Hardware-Level Multi Frame Noise Reduction and more. 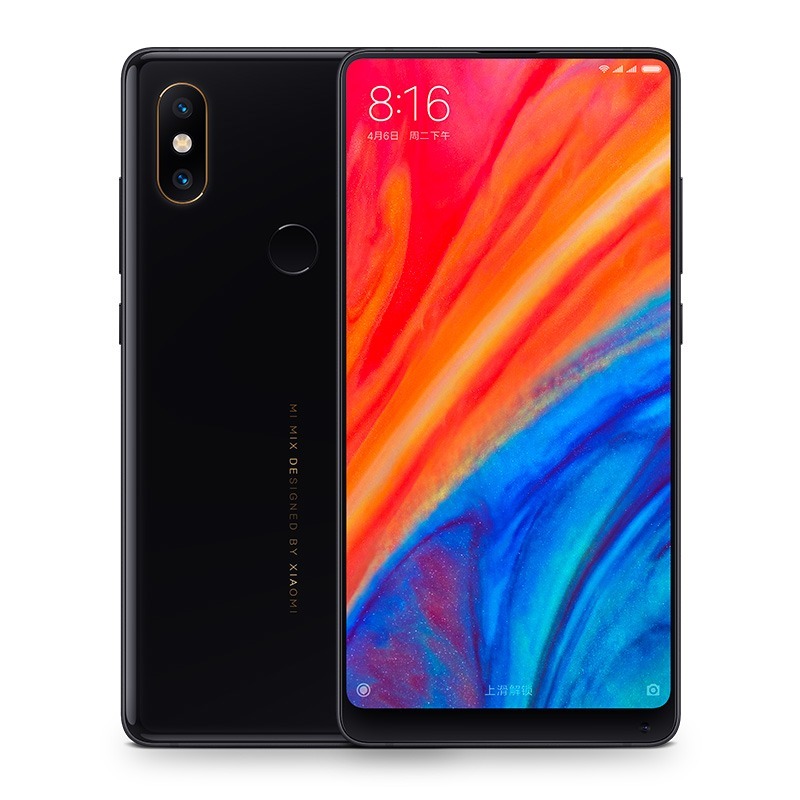 The Xiaomi Mi Mix 2S scores 97 on DXOMark and gets a score of 101 for photos which is incredible! On the front, the Xiaomi Mi Mix 2S has a 5MP camera with f/2.0 aperture and Selfie Portrait. The battery size remains unchanged as the Mi Mix 2S has the same 3,400mAh battery as the Mi Mix 2. But this time, there is Qi wireless charging support. This makes the Mi Mix 2S first phone with the ceramic build to have Wireless charging. The phone has Quick Charge 3.0 support too. Some other features include Bluetooth 5.0, USB Type-C Port, AR Core, Face Unlock, 43 Global Bands, NFC and more. With the phone, the users will also get a free Wireless charging in the box. The phone will go on sale next month. It will be available from Mi.com and the Mi Home Stores.